This is the first of a series of blog posts that delve behind the scenes of Rosetta's instrument teams to find out what it was really like "living with a comet" for two years, with some impressive statistics collected along the way. 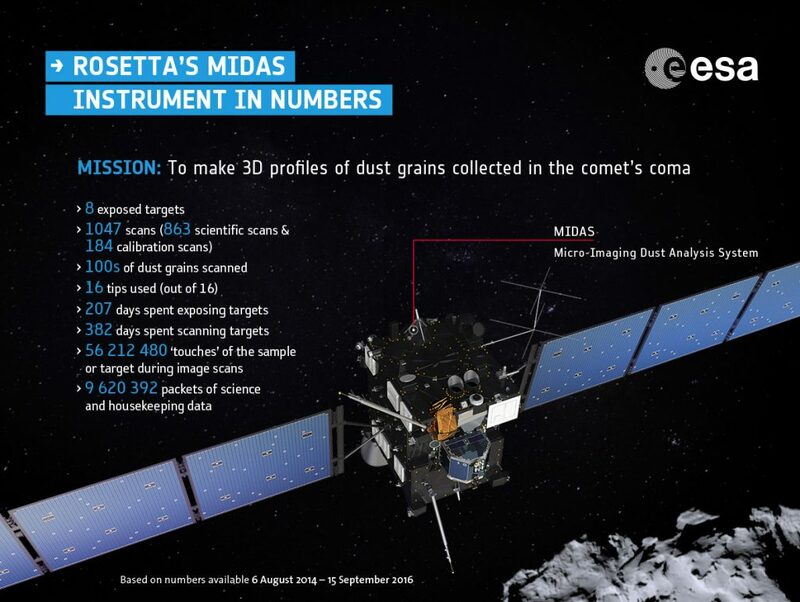 Tasked with collecting and scanning – in 3D – the comet’s smallest dust grains, Rosetta’s Micro-Imaging Dust Analysis System (MIDAS) also has one of the smallest teams: “1.2 people in the beginning”, says principal investigator Mark Bentley. But as ever with Rosetta, the numbers are big: after two years of science, Mark and his PhD student Thurid Mannel report on the highs and lows of the 52 million up-down motions of the MIDAS scanning tip. 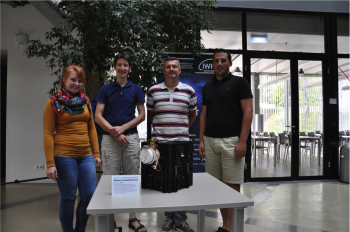 Team MIDAS: Thurid Mannel (PhD student), Mark Bentley (PI), Harald Jeszenszky (technical manager), and Roland Schmied (postdoc) with the MIDAS Qualification Model (QM). Image courtesy G. Kargl. The early days of the mission, when we were first starting operations after hibernation exit in January 2014 were pretty crazy – mainly because we were a rather small team, approximately 1.2 people comprised of me and 20% of Harald's time (Harald is MIDAS technical manager). As such I was trying to juggle many hats, from high-level science planning, to very low-level telecommand hacking – and being a father to a 3-month-old! The learning curve was also pretty steep. Although I’d been using the Flight Spare for several years, figuring out how the planning system worked and playing with real data was a challenge – but lots of fun. The only worrying moment came during one of the interactive checkouts, when Harald and myself were at ESOC watching the data come down “live”, when I realised that a parameter that controlled one of the motors was set wrong. Knowing that there was, at this point, nothing that could be done, I simply had to wait and watch the telemetry come down, hoping I hadn’t broken MIDAS before we had even got to the comet… Fortunately the engineers did their jobs very well, and everything was fine. Overall the instrument has performed extremely well, but there are always things that could be improved for the next version. One key problem is that we could only expose a target to space to collect dust OR scan a target with the microscope – not both together. Ultimately the comet was and is an unpredictable beast, and so apart from applying high level factors (e.g. closer=better) it was something of a guessing game deciding when to expose and when to scan. So I was extremely happy in February 2016 – already into the extended mission – when we happened to be exposing a target during a gas and dust outburst. Not only did this give us a target covered in dust, but many other instruments were observing at the same time, so we have started to weave a coherent story about this event and the dust we have been imaging. In fact we got so much dust on this target, that we basically stopped exposing and decided to focus our attention on this one target. And we’re still trying to image as much as possible – and will be doing to until about 12 hours before the orbiter “lands” on the surface of Comet 67P on 30 September. 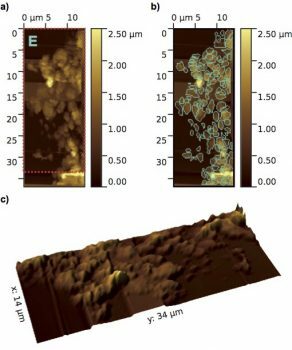 MIDAS works by collecting and then physically scanning grains with an Atomic Force Microscope. This uses a very fine tip, a bit like an old-fashioned record player needle, that is scanned over a particle. The deflection of the needle and therefore the height of the sample are measured to build up a 3D picture. This enables scientists to determine the structure of the particle, and thus gain insight into how it might have formed. I think the most surprising observation was after nearly three months at the comet and not detecting anything, we then recorded an image so distorted that we barely realised it was a large dust particle that we were looking at! Atomic force microscope topographic images of MIDAS particle E, a loosely packed ‘fluffy’ aggregate comprising many grains. (a) Overview image with a pixel resolution of 210 nm and a colour scale representing height. b) Sub-units (grains) of the particle detected at the resolution of the instrument are outlined. (c) 3D image of the particle corresponding to the area covered by the red outline in (a) with two times height exaggeration to aid visualisation. We had been exposing a facet from mid-September 2014 and looked for dust on it every now and then, but did not find anything… until 14 November. This was a great relief for us, since the other dust analysing instruments COSIMA and GIADA already sampled many dust particles. We celebrated our first dust and shared the image with you on this blog. Of course we wanted to discover more of this particle – but any attempt to re-scan it failed. Scans on different locations on this target either gave too distorted results for scientific use or were completely failing, the only bright spots were very few rather distorted, barely recognisable dust particles. It was quite an emotional roller coaster for us! Since scanning on this target resulted in more failed than successful scans we decided, with heavy-hearts, to give up on this particular target. In December we exposed a fresh target and hoped for better images of cometary dust. The new target, however, showed no dust at all until end of December – and in January we were finally able to record my most favourite scan: it is shown in Mark’s recent Nature paper as particle E (see image left) and it really stands out in our whole particle collection. We knew this already in the moment we received the image – another absolute highlight for me. Shortly after we were able to record our three smallest dust particles so far, one of them also presented in Mark’s paper as particle D. However, except for one other particle, additional scans on this facet showed no dust at all, just the empty facet. After the safe mode in 2015 we had to stay so far from the comet that MIDAS did not detect any dust particles – a rather depressing time for us. It was the end of July when we decided to use the time to go back to the target with the first particle on, the one that we abandoned earlier. We started doing very coarse and very cautious overview-scans at locations distant from the ones we had all those problems at the beginning of the mission, and discovered that the whole target must be covered with large, fragile dust particles! This was the most surprising observation for me! We had all the dust collected in the beginning of the mission without knowing it! Their height, their enormous size, and their fragility were probably causing all the distortions at the beginning of the mission. Even now, when we know about the wealth of particles we collected on this facet, their sizes and fragility makes it hard for us to image them. With a lot of patiently tweaking the scanning parameters in the end we succeeded to image at least some of the enormous particles. No other target gave us such a hard time and no other target holds so many, and such large dust particles [note that large for MIDAS is a few tens of micrometers]. This story illustrates well that MIDAS is not an instrument with high statistics but rather with high precision. Every dust particle is a precious resource due to our limited dust collection slots. And thus, my second most surprising event was when we were collecting dust particles exactly during the outburst event in February 2016. What a lucky coincidence for MIDAS! The wealth of particles we collected could keep us going for years, if it weren’t for our consumables slowly running out – we’ve now used all 16 of our scanning tips. Although in the beginning MIDAS did not have the best start, in the end we can look back at sampling dust from very different phases of cometary evolution, including different dust populations, sizes and morphologies. There is a lot of material still to be analysed to understand the dust of Comet 67P at the micrometre to nanometre size, which will be important to our understanding of how comets are built. 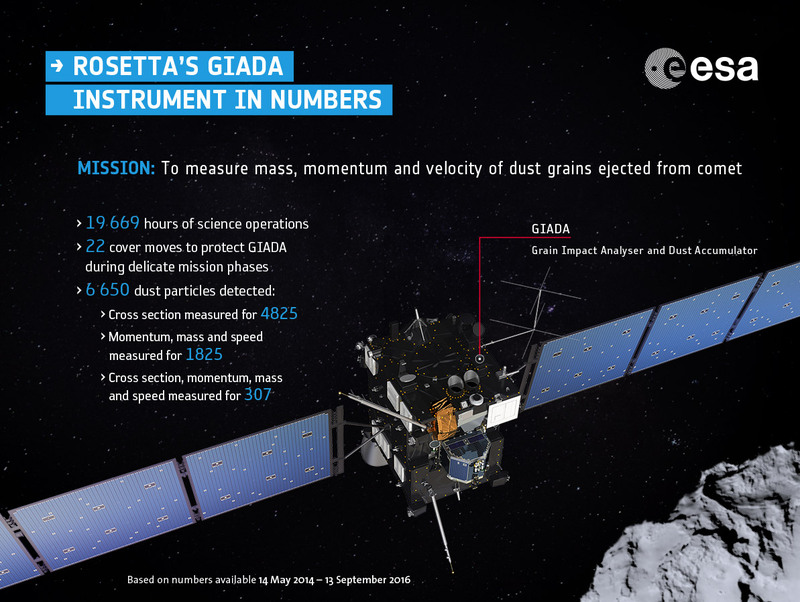 Rosetta’s Grain Impact Analyser and Dust Accumulator GIADA has detected and measured the properties of some 6650 comet dust particles. Principal Investigator Alessandra Rotundi reports on the “beautiful results” that her team’s instrument has collected at Comet 67P/Churyumov-Gerasimenko. GIADA has been on since May 2014, and we caught the first dust grain on 1 August 2014. The first love is never forgotten! It was the most exciting measurement, and such an emotion! I cannot say that it was unexpected, though; we actually estimated that we’d start detecting dust in that period, and in particular, one of the GIADA Co-Investigators (Eberhard Grün) foresaw exactly 1 August as the starting point for our dust detections! Since then GIADA has collected 6650 dust particles. For 4825, the cross-sections are known, and for 1825, the momentum, mass and speed are also known. Among this group we also know the cross-section for 307 particles. We always hope for combined particle detections by the GDS (Grain Detection System) and the IS (Impact Sensor) subsystems because these combined detections provide the greatest number of information for individual dust particle, i.e. the momentum, the speed, the mass, the optical cross section and the density. We’re very happy with what we’ve achieved, but of course there were times where we could not collect any dust due to routine operational activities of the spacecraft and when we were very far from the comet for spacecraft safety reasons. For example, there were times when we had to close the cover to protect the sensitive instrument interior during cruise phase, during the approach manoeuvres, and 22 times during our time at the comet. We also had to switch off the GDS laser subsystem 47 times for safety reasons, for example when the spacecraft was pointed (for the benefit of other instrument measurements) such that sunlight would be shining directly into the laser curtain of the instrument. This action prevented overheating of the lasers and saturating the GDS subsystem, effectively making it blind. At some point we also noticed a critical increase in ‘noise’ recorded by GDS: it was due to the dust deposited on the optics. To fix this issue we had to send software patches to increase the subsystem's noise thresholds in order to be able to continue our observations. This operation was performed four times and always with success. Aside from that very first dust collection, two other events stand out as being particularly exciting for us. 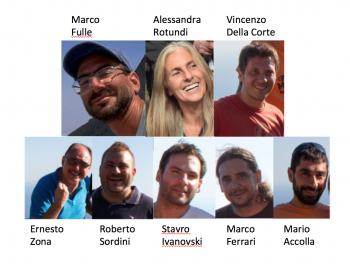 Without doubt one was the outburst on 19 February 2016 – the GIADA ‘events’ were the first clue that something interesting had happened, and what resulted in us alerting the other instrument teams to see what corresponding data they had collected. Of course, we are also looking forward to the end of mission descent, where we hope to collect even more interesting data. Taking stock of the instrument performance over the lifetime of the mission I have to say that GIADA behaved greatly; we have really beautiful results and are exploiting the data to reach results well beyond what we had nominally expected. This post is part of a series that looks behind the scenes of the instrument teams to find out what it was really like "living with a comet" for two years. Comet dust particles may be small, but they come in large numbers. COSIMA Principal Investigator Martin Hilchenbach shares some impressive facts about the instrument’s performance, and reflects on the personal highlights of the team during Rosetta’s mission. 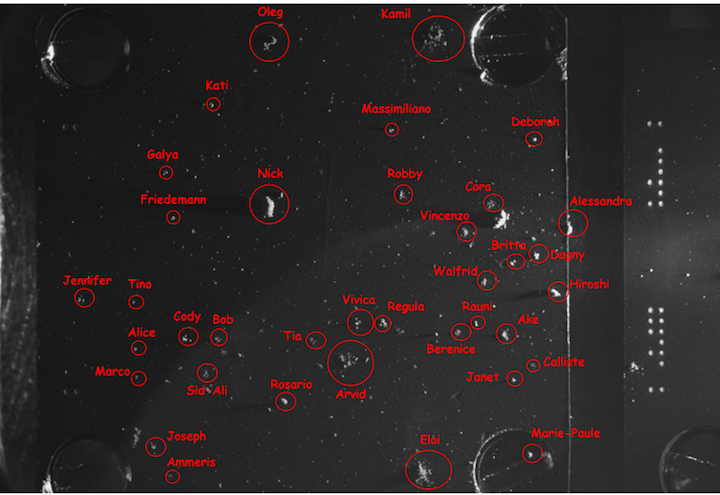 Impressively, one single COSIMA team member, Sihane Merouane, identified and labelled all imaged particles and compiled the archive list, and 6053 particles now have proper names – the first assignments given for COSIMA and the wider Rosetta team members and their families. According to Martin, it would take around five hours to read out the list of names assigned to the particles on just one target. There have been 21 targets in total exposed. Meet some of the COSIMA grain family! The target plate measures 1cm across, and shows dust grains collected between 11 August and 12 December 2014. 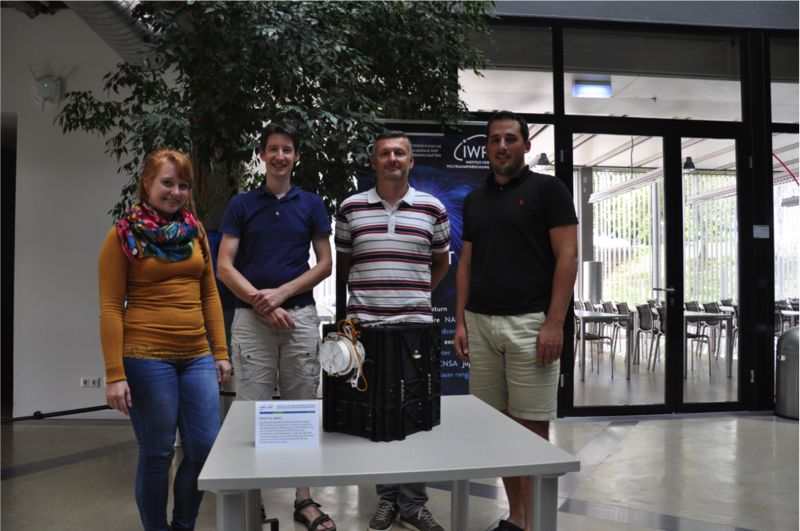 Credits: ESA/Rosetta/MPS for COSIMA Team MPS/CSNSM/UNIBW/TUORLA/IWF/IAS/ESA/BUW/MPE/LPC2E/LCM/FMI/UTU/LISA/UOFC/vH&S. And these targets are small – just one centimetre square each. Of course, the comet dust is even smaller; COSIMA is optimized to study particles a few tens to hundreds of micrometres in size – although the largest particle imaged by COSIMA exceeded 2 mm! The grains were identified in 9522 snapshots made by the COSIMA microscope, and selected grains were analysed with a secondary ion mass spectrometer. That is, they were fired at with a beam of indium ions, sparking individual ions (secondary ions) from their surfaces, which were then analysed by the mass spectrometer. This process reveals the composition of the grains, which in turn contributes to our understanding about the composition of the primordial matter from the early Solar System. While at Comet 67P/C-G COSIMA fired its ion beam 8 billion times, resulting in the detection of 35 million silicon secondary ions, 2.8 million carbon ions, 13 million sodium ions and 1 million magnesium ions, as well as generating 34 595 secondary ion mass spectra. Reflecting on how the team’s personal lives have evolved over the course of the mission, Martin notes that 7 team members and their spouses have collectively had 12 babies since Rosetta launched in 2004. He also notes that all the software written for the COSIMA development, testing, operation and archiving since 1998 has spanned 12 programming languages, more languages than spoken by the 59-strong COSIMA team. Programming is not the only thing that happens on Earth while COSIMA is busy collecting dust. The COSIMA team have prepared and worked with 304 reference model test targets for secondary ion yield calibrations as well as instrument parameter fine tuning, and the vacuum pumps of the COSIMA reference model has operated for 102,720 hours. On summing up the highlights of COSIMA’s discoveries, Martin concludes: the tiny bits and pieces of dust particles collected in the coma of Comet 67P/C-G revealed their heterogeneous composition, their fragility and their close family relation to interplanetary dust particles. As Rosetta began homing in on Comet 67P/Churyumov–Gerasimenko in the weeks leading up to its arrival in August 2014, it became very clear that this was no ordinary comet. But its striking shape was only just the beginning of the comet’s surprises. 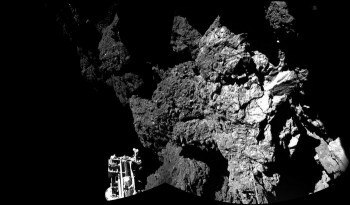 After more than two years spent living with the comet, Rosetta scientists reflect on some of the mission’s unexpected discoveries, the mysteries solved and the new questions raised. 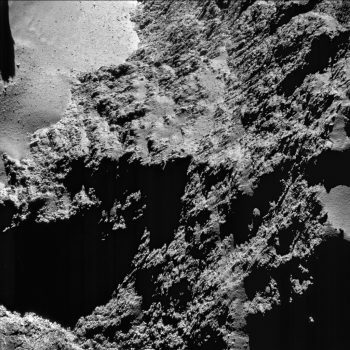 Compilation of the brightest outbursts seen at Comet 67P/Churyumov–Gerasimenko by Rosetta’s OSIRIS narrow-angle camera and Navigation Camera between July and September 2015. 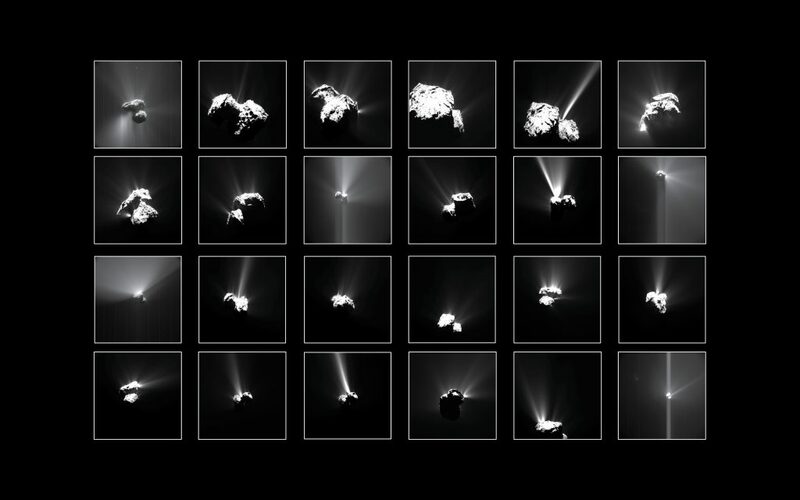 “Rosetta has completely changed our picture of comets,” says Eberhard Grün, an interdisciplinary scientist working on the Rosetta mission at the Max Planck Institute for Nuclear Physics in Heidelberg, Germany. While many of the results from the mission highlight the findings of individual instruments – 11 on Rosetta and 10 on Philae – the role of the interdisciplinary scientists is to keep abreast of the findings of the entire mission, and see how the different results fit together and develop a more comprehensive view of how the comet ‘works’. “It is only really in the last few months that it felt like all the pieces of the puzzle were falling into place without effort, and step-by-step it is becoming clearer which of our results are the crucial keys to deciphering the ‘Rosetta stone’ we have in our hands,” says Marco Fulle, also a Rosetta interdisciplinary scientist, based at the National Institute of Astrophysics, Trieste, Italy, and lead author of a papersummarising a number of the most unexpected and significant findings made in the first two years of data analysis. One big open question concerned the origin of comets. 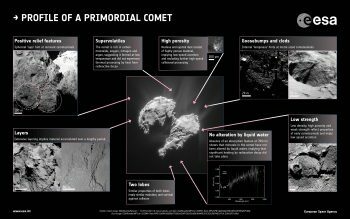 “This was one of the things I was really looking forward to finding out about: just how primordial are comets?” says Bonnie Buratti from NASA, who acts as their project scientist for Rosetta. Nitrogen and oxygen in particular need low temperatures to be trapped in the comet’s ices, so the fact they are observed outgassing today along with water vapour suggests they were incorporated into the comet during its formation. Deuterium-to-hydrogen in the Solar System. Click for full caption. Data from Altwegg et al. 2014 and references therein. The ratio of deuterium – an isotope of hydrogen with one additional neutron – to normal hydrogen found in the comet’s water holds other important clues to the conditions in which the comet was born. Theoretical simulations indicate that this ratio should change with distance from the Sun and with time in the first few million years of Solar System history. 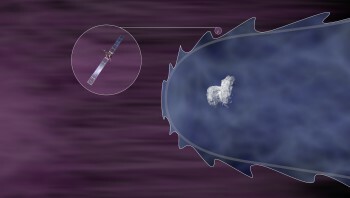 Since the ratio does not change during a comet’s life, it is an important indicator of the conditions at the time of the formation of its constituent ingredients, and therefore where the comet was most likely born. The ratio has been measured for 11 comets, mainly via remote observations, and Rosetta’s comet has the highest of them all. This suggests that comets formed over a much wider range of distances from the Sun in the young Solar System than previously thought. Rosetta’s measurement of the ratio was also one of the most anticipated results of the mission for another reason: its direct link to the source of Earth’s oceans. Was water brought to our planet by comets or asteroids? 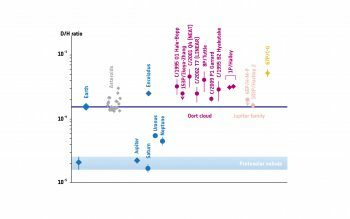 Rosetta found that its comet’s water is quite different to that of Earth’s, and indeed of other comets and asteroids too, again indicating a diverse origin. “We have made great progress in starting to address the big questions Rosetta set out to answer, but full answers will take time,” says ESA’s Rosetta project scientist Matt Taylor. 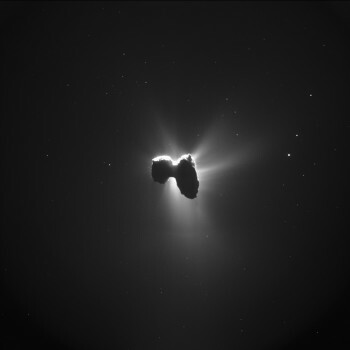 “The comet shape is extremely important to link what we see on the surface of the nucleus to our observations of the coma using both Rosetta’s in-situ instruments and remote sensing,” says Marco. “We now know that this is related to the shape of the comet, and the way the release of gas from the two lobes distributes internal stresses between the body and head. This allows the spin axis to remain well fixed in space, which in turn means regular seasons and repetitive behaviour along the comet’s orbit,” says Marco. Owing to its double-lobed shape and the inclination of its rotation axis, the comet’s seasons are very different between the two hemispheres over its 6.5 year-long orbit. For most of the orbit, the northern hemisphere experiences a very long summer, lasting over 5.5 years, while the southern hemisphere undergoes a long, dark and cold winter. While some of the dust is redistributed around the comet in this way, some particles are also ejected at speeds high enough to escape the gravity of the comet. 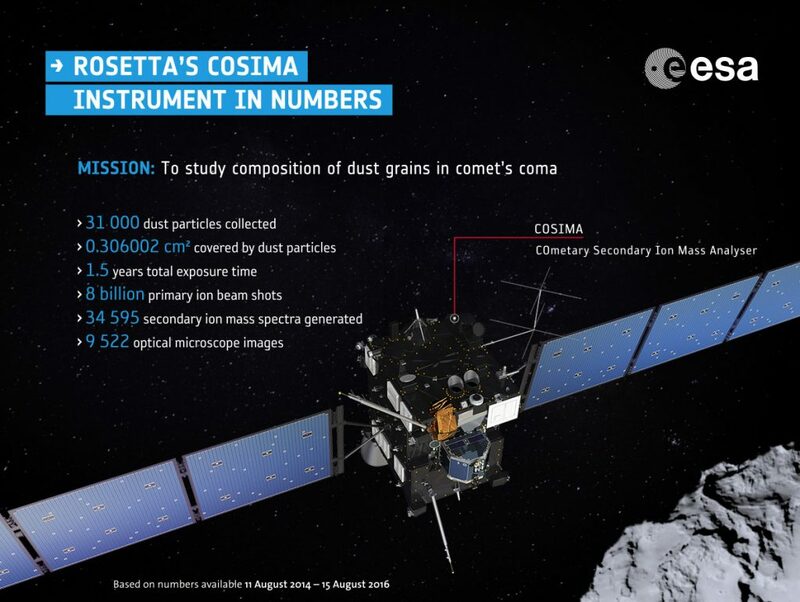 A tiny fraction was then collected by Rosetta’s dust-analysing instruments. “The dust ‘showers’ recorded by the GIADA instrument were one of the most surprising observations of the mission for me,” says Marco. Dust showers describe a cluster of dust particles detected by the instrument over a sustained period; some previously reported showers were observed to last 0.1– 30 seconds. But how the dust actually leaves the surface of the comet is still an open question. “To win against the low gravity of the comet is easy, but overcoming the stronger Van der Waals electrical forces binding the dust particles to each other still remains a mystery,” adds Marco. Magnetic field-free cavity at comet. Click for full caption. The diamagnetic cavity is a region devoid of magnetic field, arising at the interface between the incoming solar wind and the outflowing gas from a comet. Based on previous observations at other comets, theoretical simulations had predicted that such a cavity would extend only 50–100 km from the nucleus during the comet’s most active months, but one of the first detections made by Rosetta was at 170 km. “Rosetta has shown that this region and its boundary are particularly dynamic and as a result we’ve been lucky enough to make a number of observations of the boundary as the magnetic field-free region repeatedly passed around the spacecraft,” says Matt. The results of Rosetta are helping to put the observations of other comets in context and vice-versa: without the results of previous missions, some of Rosetta’s results would be hard to understand. “The results of NASA’s Stardust mission to 81P/Wild-2 certainly helped us to better understand our dust,” adds Marco. “Comparing the results of various missions is not trivial. Most missions prior to Rosetta only collected snapshots as they flew past their targets, so it is hard to understand how representative those brief observations were of each comet, especially in terms of their composition. But even with over two years of data now safely collected, tracking the comet through its most active period as it passed through perihelion, and giving unrivalled insight into the evolution of the comet, this is still only the beginning of Rosetta’s big discoveries. Matt agrees: “For me, the big answers will surely come by piecing all of this together and combining observations with new models – which can now be improved thanks to Rosetta’s results – to address how comets work, where they come from and how they fit into Solar System’s history.